NDP | "Under the Hood"
I wrote a little ditty on my views about the Canada Post back to work legislation, and the valiant efforts of the NDP to filibuster it down. View it here on a new group blog: Disgruntled Goats. Playing footsy, or just being sensible? 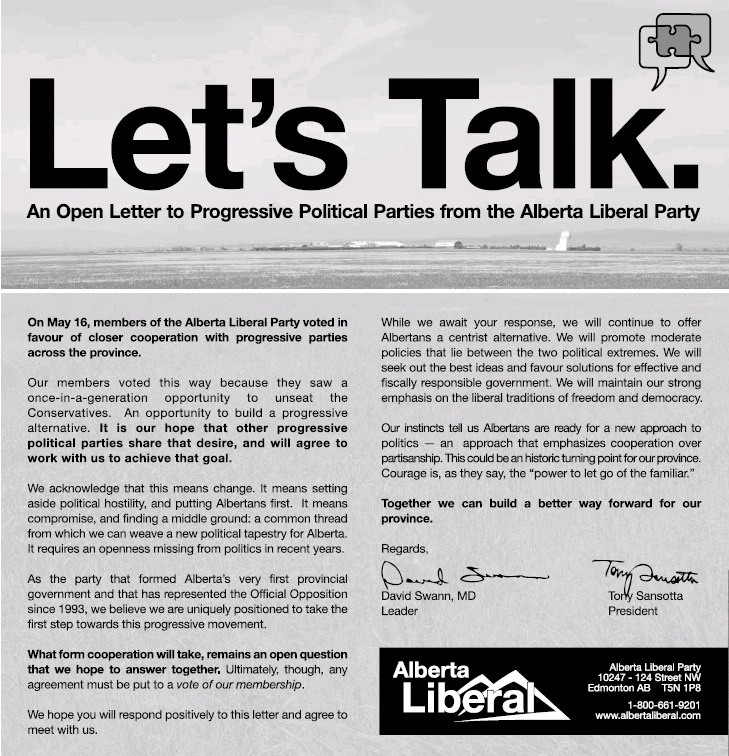 The Alberta Liberal Party put forward, an albeit desperate but still clear-headed, open letter to the NDP (and assuming, the Alberta Party) to join forces as a progressive coalition. While their intention comes off as a second chance prom date, the Liberal party is doing what progressives have been calling for over the past five years: reaching out to be bigger, stronger, and better representatives. The NDP response was a much less welcoming and firmly planted them in the “we don’t want to share our toys” category. The fact of the matter is that the Wildrose Alliance will be picking up seats come election season. The Progressive Conservatives are unlikely to be ousted quite yet, as they still have the star hitters running for re-election and Albertan’s still support the party. The Alberta Party may get some votes in, but not having any members south of Calgary and focusing in urban centers, where votes go to die, certainly won’t guarantee them any party status. The Liberals, the NDP, and the WAP have strong and well liked members. While, the NDP’s two makes up for a good number of inactive and ineffective PCs, however, they number is still two. Two very hard-working, very intelligent people, but again, still two. Two against eighty-one, and clearly it is against. We have seen these dog fights time and time again. Electoral academics must be shaking their heads as they see the numbers dance before them, as they see potentially progressive ridings go nowhere, and keep on keepin’ on. I am not a partisan hack, and I am a little too jaded to have believed anything positive would come out of Swann’s open letter, but somewhere, deep down inside, I cared. The NDP may say the Lib’s stand for nothing, and have no party guidance but at least they recognize that Alberta is in trouble democratically and they reached out. For themselves, but also for Alberta. Swallow your pride progressives, and do something that isn’t for your party brand or your personal political ideology but for the good of democracy and Alberta. p.s. – I have to say, I took some exception to the NDP’s claim of responsibility for ridding the Alberta Legislature of the ‘third way’ discussion. I’d like to think Albertans and the many non-partisan advocacy groups involved in health care campaigns had something to do with it too. Small hopes in a sea of blue. The Canadian Election has come and gone and while I guess I could be more disappointed with the results, I am pretty much at the peak of disappointment. Here is the quick and dirty for you non-Canadians or those who don’t like the CBC. – Another Conservative minority with 143 seats. – Liberals see the lowest popular vote since confederation with only 26% garnering them a grand total of 76 seats. Dion’s leadership is up for speculation. How long will this opposition leader last in his own party with heavy weights like Ignatiff and newly elected Justin Trudeau clearly able and ready to take over the helm? – NDP gained 8 seats and the Edmonton – Strathcona race was the nail bitter of the century and kept me up until that last poll was called it. Congrats to Linda Duncan for making it happen in the sea of Blue. – No Green seats but the valiant effort and bold choices of May should not go unnoticed. I hope this leader continues on. Who knows, at next year’s election, things just may change.